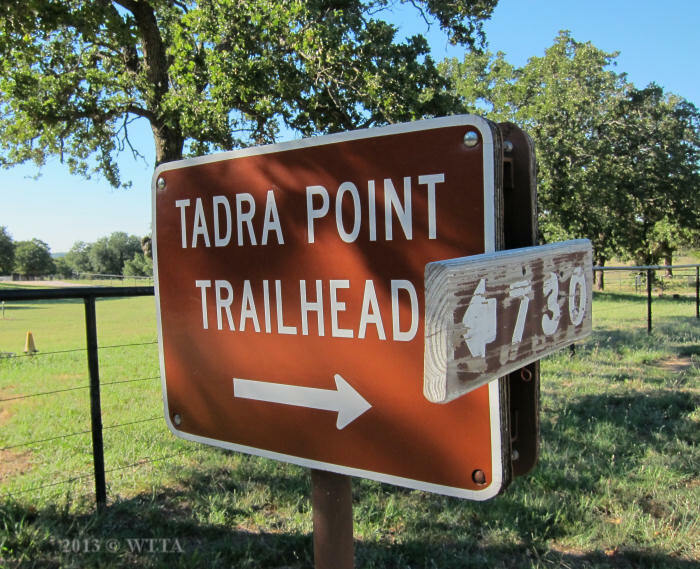 Directions to TADRA Point main equestrian trailhead for the park: Avoid going around past Cottonwood Lake as the park’s website recommends when pulling a trailer of any size. Large trailers can slip off the narrow road over the levee to the dam and get high centered before the cattle guard past the dam. Directions from Dallas: I-35E north to I-35 in Denton continue north exit Highway 380W to Decatur, you will go west 24 miles to FM 730, right exit (signs also say Airport) then go left, north 9.5 mile to CR 2461 (sign will also say Cemetery) turn left onto CR 2461, 100 yards turn left and follow around to forest service road 904, turn right and follow signs to camp at TADRA Point. Directions from Fort Worth: I-35W north to US-81, go northwest to US-287 then northwest US-380 head east (stay in left lane) less than a mile to FM 730, left (signs also say Airport) then go north, left, 9.5 mile to CR 2461 (sign will also say Cemetery), turn left onto CR 2461, 100 yards turn left and follow around to forest service road 904, turn right and follow signs to TADRA Point. Direction from Oklahoma: I-35 south to Highway 380 West [just north of Denton] to Decatur, you will go west 24 miles to FM 730, exit right (signs also say Airport) then go left, north 9.5 mile to CR 2461 (sign will also say Cemetery), turn left onto CR 2461, 100 yards turn left and follow around to forest service road 904, turn right and follow signs to TADRA Point or Off of 35, in Gainesville, Exit Hwy 51, California Street towards Decatur. Go about 23.8 miles, and go right on FM 455, Go 7.1 miles, and go left on FM 730 (near some big towers) Then a little past 7 miles, you will go right on 2461, then follow instructions above. Directions from Wichita Falls: Highway 287 South almost to Decatur. Take Hwy 380 East, stay in left lane, about 1 mile (Airport exit) to FM 730. Turn left and take FM 730 North. Follow directions above from here. Once you are in the Grasslands you will see brown signs to TADRA Point (but these can be very hard to see in the dark). Facilities: Camping at TADRA Point is primitive with no running water faucets or electrical hookups. 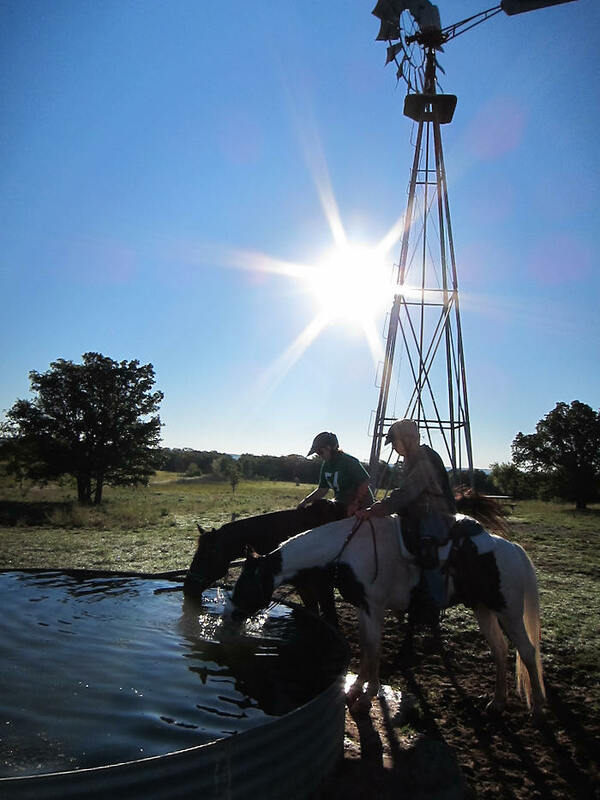 Water is available for horses either from the windmill powered water tank or the stock pond. TADRA Point also has a covered and lighted pavilion and two vault toilet facilities. Most of the campsites have two tie posts for your horses, a gravel pad to park your trailer, and numerous shade trees. There are also campsites at Bois D’ Arc and Valley View which have similar facilities. Valley View can be rented out for group use. Camping: Overnight camping and equestrian camping is allowed. Reservations: Reservations cannot be made for individual campers, it is on a first come first serve basis. You might be able to rent out the entire camping facilities, such as Valley View, for organized events, please contact the park for details. Mileage: Over 75 miles of trail! There are five color coded trails which can all be access from TADRA Point. 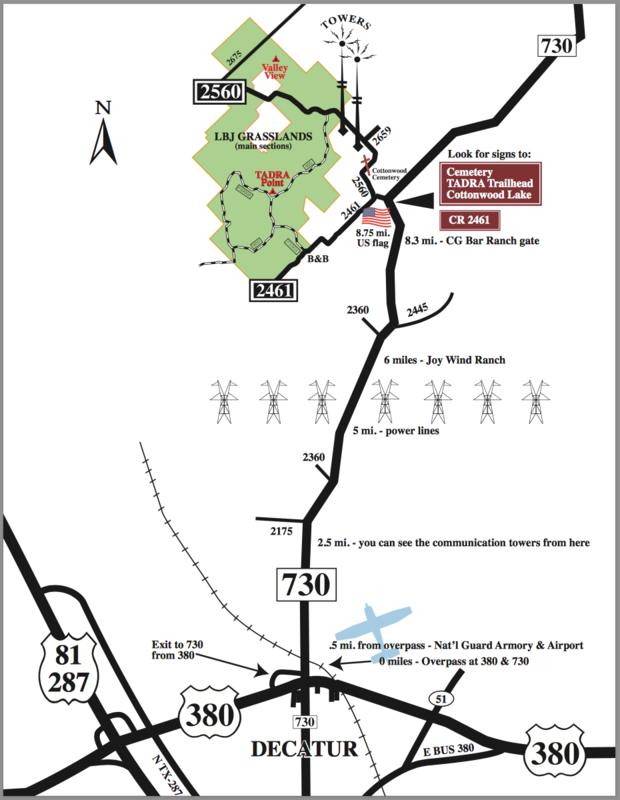 Map: A trail map can be purchased at the park office for $10.00 in person or $11.00 if you have it mailed to you. 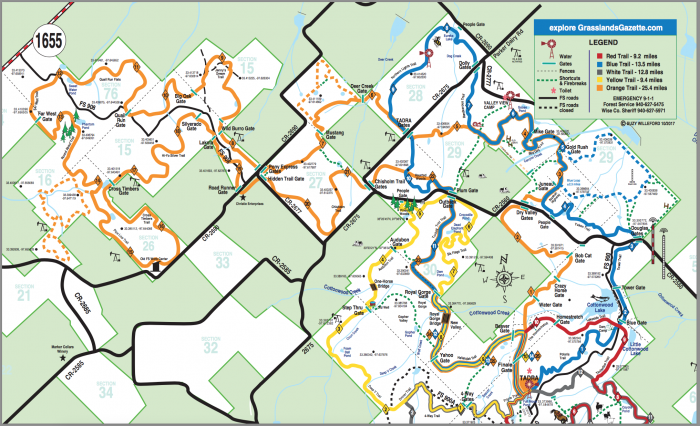 I’d suggest purchasing a map before your trip so you can plan out where you would like to ride and study the trails before your trip. 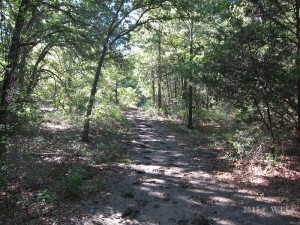 Be sure to check http://www.grasslandsgazette.com/lbj-grasslands-trail-map/ for the latest trail maps. Terrain: The terrain is mostly sandy flat ground with just a few rocky sections and a few trails which have some ups and downs. Overall, the terrain is not challenging. Cell Phone Service: I have ATT service which did not work in my trailer but I did have service outside of my trailer. Hunting: Hunting is allowed during the permitted season. Hunters are required to wear florescent orange except when hunting migratory birds or turkeys. It is recommended riders and other park users wear florescent orange during the hunting season as well. 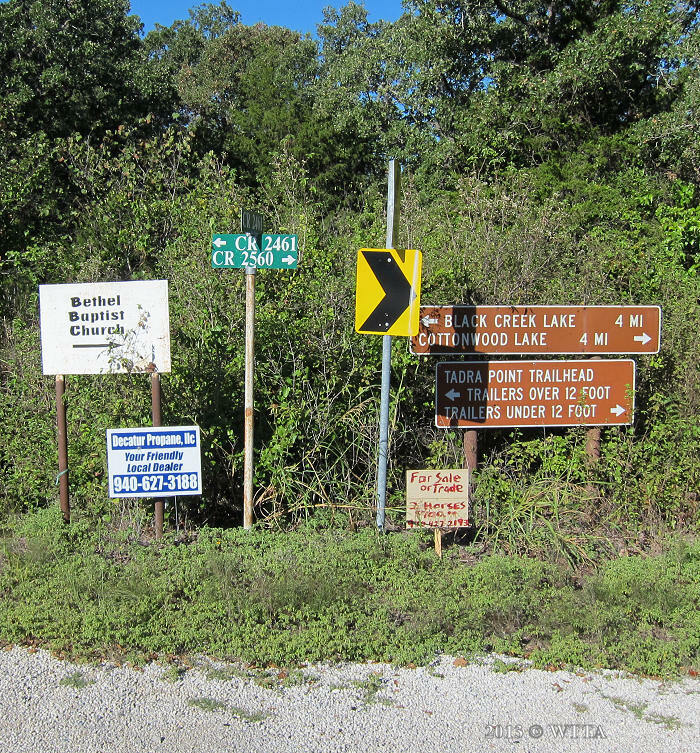 Hunters are required to be 150 yards away from the roads, marked trails, park boundaries, and lake shorelines. 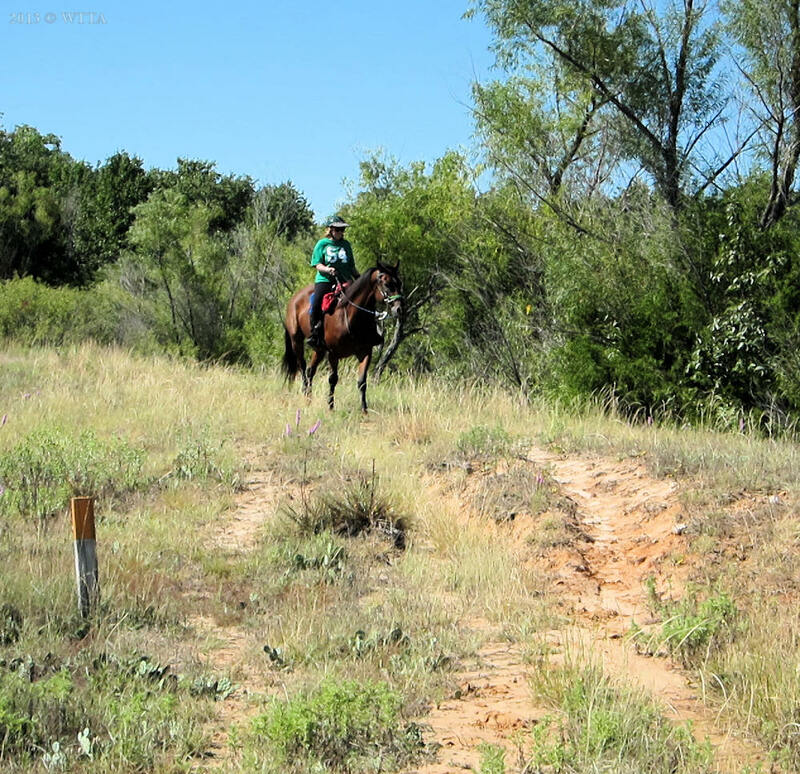 If you want to get lots of miles under your horse, then visit Lyndon B. Johnson National Grasslands, a popular equestrian destination, just north of the Dallas / Fort Worth Metroplex. 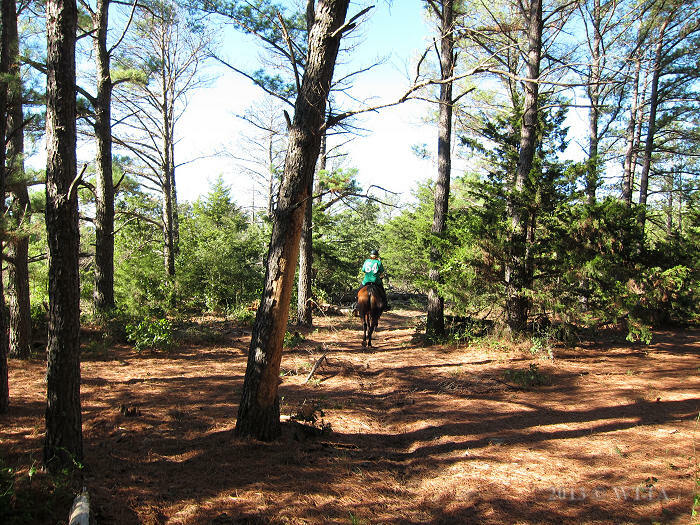 Managed by the US Forest Service, the park has approximately 75 miles of well-marked trails. 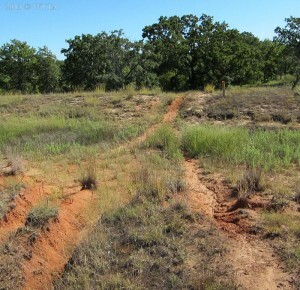 LBJ Grasslands has just about 20,250 acres and Caddo Grasslands has just about 17,755 acres. The term “grasslands” can be a little deceiving and lead me to believe this park would consist of wide open spaces of tall native grass prairies. Although several sections the park do consist of open grasslands a large section of the park consists of thick forests with heavy undergrowth. I learned that the title “grasslands” is really a term designating the land as protected. LBJ Grasslands was originally called the Cross Timber National Grasslands due to the thick belt of forest running along the area, but the name was changed sometime in 1974 in honor of President Lyndon B. Johnson. 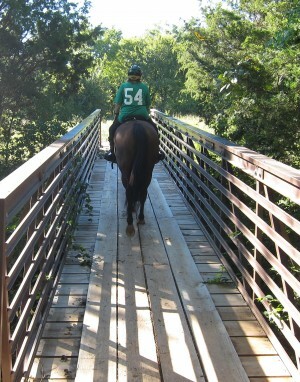 The multi-use trail system is shared by equestrians, cyclists, and hikers. Motorized vehicles are not allowed on trail. However, several roads traveled by vehicles and ATVs run within park boundaries and intersect with the trail system. You and your horse will become pros at maneuvering through the many gates in the park. You will often come to a gate before a road crossing. 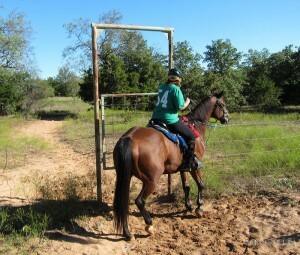 The gates are fairly simple to open and close from horseback due to the higher placement of simple chain hook latches. Although the trail system is expansive and scenic, you don’t get that feeling of being in the middle of nowhere. For this reason I feel safe when riding alone in the park, if you get turned around or in trouble you are bound to run into a landmark, road, or another park user to help. 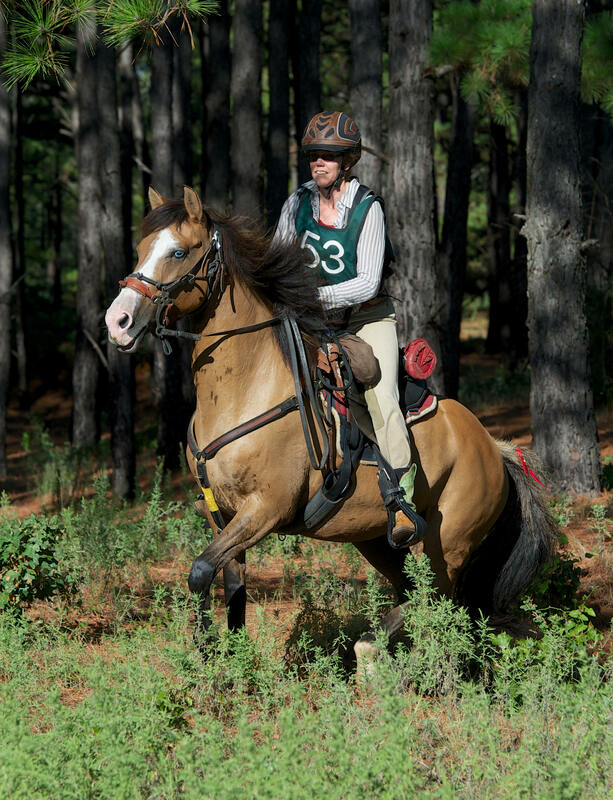 The main equestrian trailhead and camp ground known as TADRA Point accesses all five loops of the trail system. TADRA (Texas Arabian Distance Riders Association, Inc.http://www.tadra.org/) members have donated time and labor to create and maintain many miles of trails and to construct restroom and camping facilities at TADRA Point . Camping at TADRA Point is primitive with no water faucets or electrical hookups. 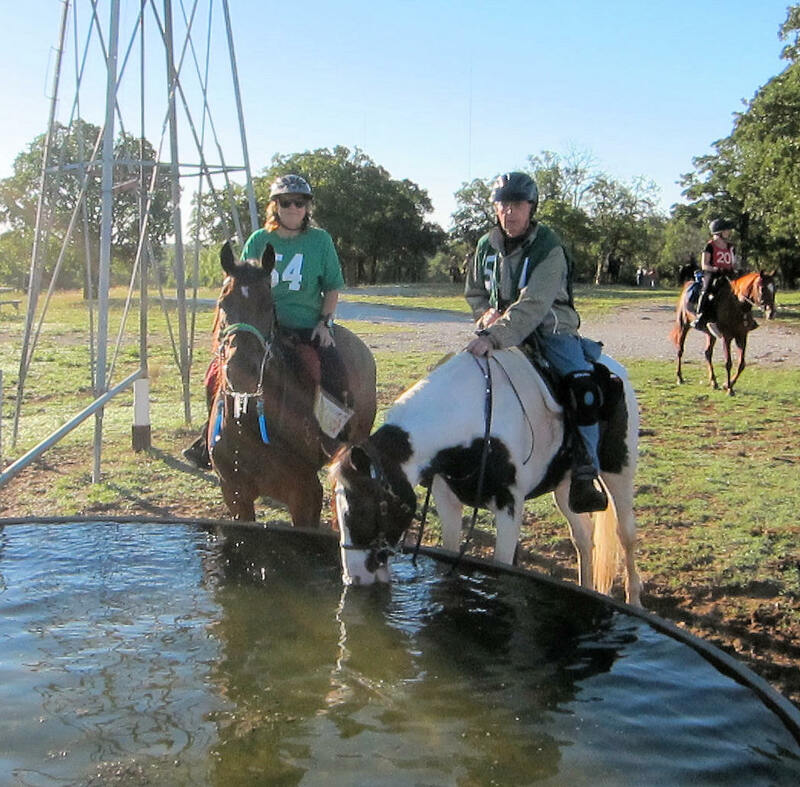 Water is available for horses either from the windmill powered water tank or the stock pond. I decided to fill up my trailer’s water tanks and bring all the water I could from home to avoid hauling water from the camp ground tank to my campsite. I also took many opportunities to ride or lead Angel over to the windmill and hung out with her there while encouraging her to drink directly from the tank. The windmill and its eerie sounds did not seem to concern her. I rather enjoyed staring up at the metal marvel and wondered why so many people, to include myself, are attracted to such ancient but extremely useful technology. These visually pleasing contraptions used well over a 100 years ago still find great purpose even today. Maybe that is the appeal in today’s world of throwaway technology, what is good today is out dated tomorrow. TADRA Point also has a nice covered and lighted pavilion and two vault toilet facilities. 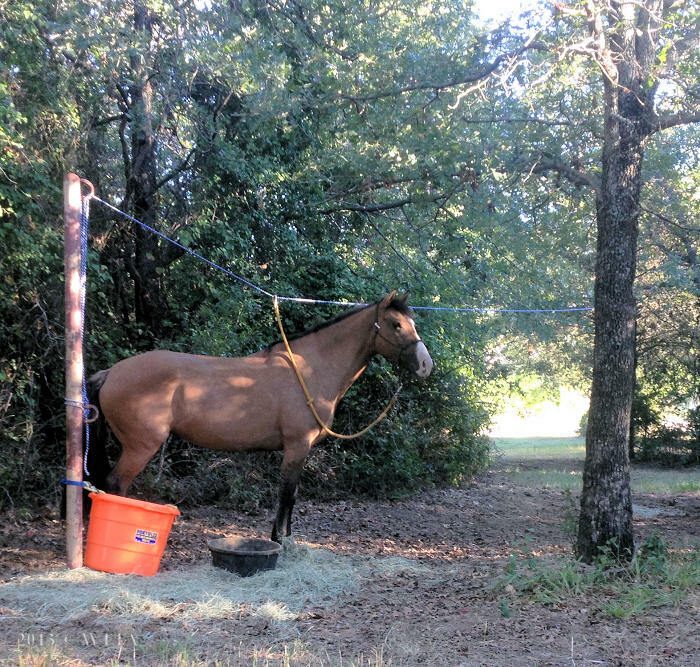 Most of the campsites have two tie posts for your horses and a gravel pad to park your trailer. By far the best quality of TADRA Point is the numerous oak trees providing cool shade and natural beauty. The park comes to life with deer, armadillos, and other wildlife at dawn and dusk. Don’t be surprised if you are fortunate enough to spot a critter in the middle of the day as well, such as hogs, skunks, hawks, snakes, etc… I had to ride around a very annoyed skunk who was aiming and ready to fire! Cattle roam the grasslands and the park is popular with bird dog enthusiasts. 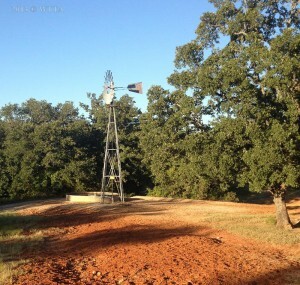 The Valley View camping site is often rented out and used for bird dog training and events. Hunting is allowed at LBJ but hunters are to remain 150 yards away from designated trails, roads, lake shoreline, and park boundaries. During hunting season it is recommended you wear florescent orange. 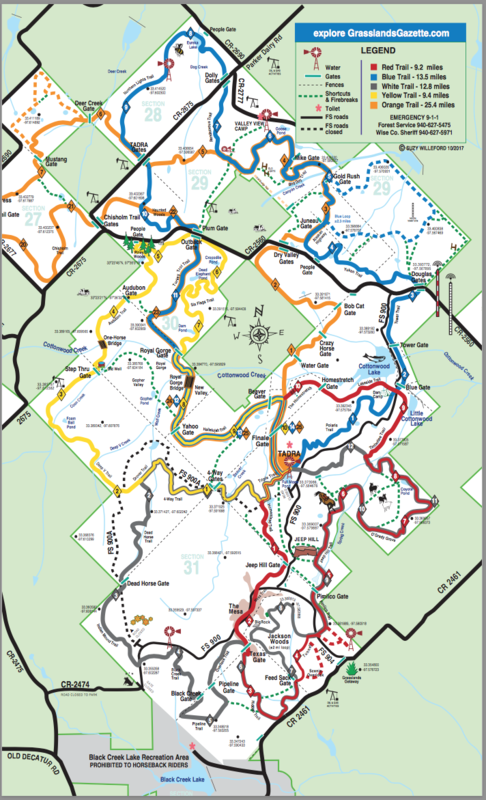 LBJ trails consists of five color coordinated loops; the 25.5 mile Orange trail, the 14.5 mile White trail, the 14.4 mile Blue trail, the 10.7 mile Red trail, and the 10.4 mile Yellow trail, all originating from TADRA Point. Wow, that’s a lot of miles in one park! The terrain is mostly sandy flat ground with a few rocky sections on the Red and White trails. I rode Angel barefoot with no issues. The park is a mixture of open prairie and forest land. Some areas have gentle rolling hills with only a very few spots of mildly challenging inclines and descents. The Red trail offers a bit more diversity in terrain type, takes you to the shoreline of Cottonwood Lake, and provides an overlook. The White trail also has a great overlook area. 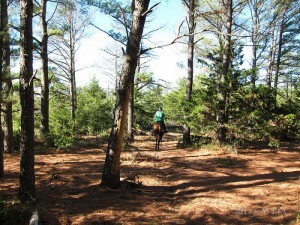 I enjoyed the Yellow and White trails best, as I prefer forest trails with lots of shade. The Yellow trail also has a cool wooden bridge to cross and a piny forest area distinctly different from the rest of the park. 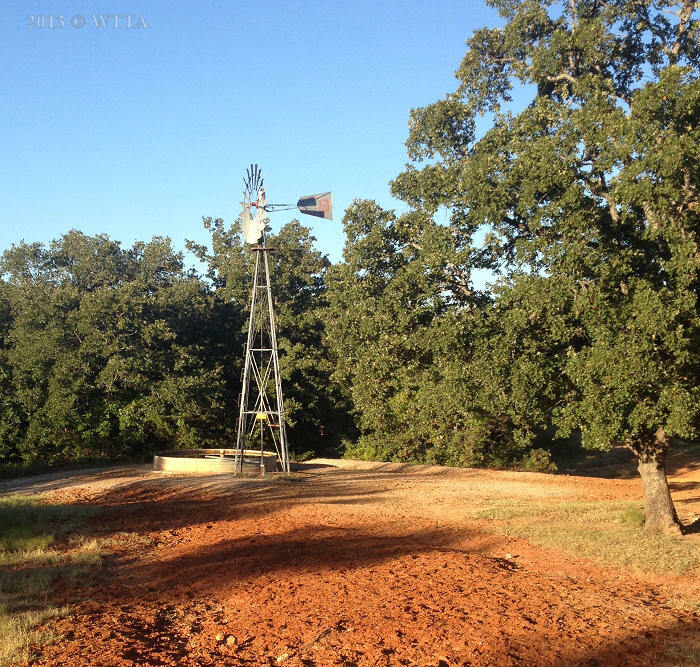 Ponds and windmill powered water tanks are scattered throughout the park. Kelly & Angel. Photo provided by Jim Edmondson with Optical Harmonics. My trip to LBJ this past September in 2013 consisted of many firsts; my first trip to the park, my first time to drive solo in our new truck pulling our trailer over 600 miles round trip, my first time to use four wheel drive, and the first time Angel and I won sweepstakes for placing first in horsemanship and first in horse categories in our division at the NATRC (North American Trail Riding Conference) competitive trail ride. I must thank CAM Forge Farrier Services (Mr. McConnell) for making and donating the eye catching copper plated horseshoe sweepstakes plaque – THANK YOU! Needless to say we had a good time and really enjoyed the park! I don’t recommend driving into the park for the first time in the dark and rain. Although there are signs pointing you to the TADRA trailhead, they are hard to see in the dark. The roads are mostly sandy caliche material which gets very sticky in spots during a heavy rain. I was driving very slow due to being unsure of my route, and I got stuck. Using four wheel drive for the first time to free myself out of a mucky situation was quite empowering, boy I am glad we now have 4×4 capabilities. Luckily a friend (Thanks Liz!) met me at the crossroads and I followed her the rest of the way to the TADRA Point campgrounds. I thoroughly enjoyed this park and can’t wait to return.